Eurofound’s European Working Conditions Survey (EWCS) paints a wide-ranging picture of Europe at work across countries, occupations, sectors and age groups. Its findings highlight actions for policy actors to help them address the challenges facing Europe today. In 2015, Eurofound carried out its sixth survey in the series (in operation since 1991). This sixth survey interviewed nearly 44,000 workers in 35 countries. Its findings provide detailed information on a broad range of issues, including exposure to physical and psychosocial risks, work organisation, work–life balance, and health and well-being. Following the publication of the Sixth European Working Conditions Survey – Overview report in November 2016, a number of reports and policy briefs on specific themes and drawing on the EWCS data were commissioned and published in 2017 and 2018. How to combine work with life is a fundamental issue for many people, an issue that policymakers, social partners, businesses and individuals are seeking to resolve. Simultaneously, new challenges and solutions are transforming the interface between work and life: an ageing population, technological change, higher employment rates and fewer weekly working hours. The report Striking a balance: Reconciling work and life in the EU aims to examine the reciprocal relationship between work and life for people in the EU, the circumstances in which they struggle to reconcile the two domains, and what is most important for them in terms of their work–life balance. Two-thirds of the EU labour force are in permanent, full-time employment; the remaining one-third has a non-standard employment status, meaning temporary or part-time employment or self-employment. Given the variety of employment statuses, it is worth asking whether working conditions differ across them. The policy brief Does employment status matter for job quality? 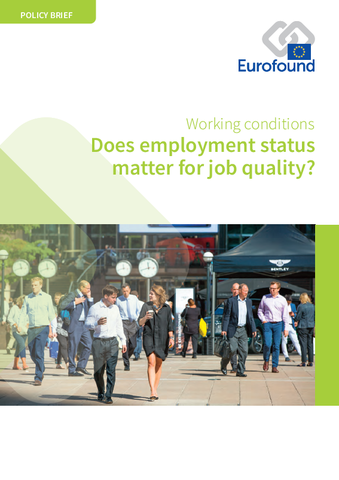 uses data from the 2015 European Working Conditions Survey to investigate the job quality associated with different employment statuses in the 28 EU Member States. It finds that temporary and part-time workers, as well as self-employed workers without employees, are more likely to experience poorer job quality than permanent employees. Despite years of gender equality legislation, men outnumber women in management positions by two to one. While structural barriers continue to impede women’s career advancement, women themselves may be deterred from becoming managers if they perceive that it would have a negative impact on their working and personal lives. What is the experience of women in management roles and how can their underrepresentation in management be addressed? The policy brief Women in management: Underrepresented and overstretched? seeks to answer those questions by looking at the job quality of managers, both female and male, and the impact a management job has on personal life. Demographic change is changing the face of working life across the EU. The increased demand on a shrinking pool of workers to provide for the social needs of an ageing population is leading to increases in the employment rate of older workers and a lengthening of working life. Policy reforms have – on the whole – focused on raising the statutory retirement age and providing financial incentives for older workers to remain in work beyond retirement age. However, a range of other factors also influence workers’ decision to continue working into old age – including health and well-being, work–life balance, career prospects and job security, and working conditions such as autonomy, hours of work and psychosocial aspects of the workplace. The report Working conditions of workers of different ages analyses these factors in depth for the 28 EU Member States, using data from the latest European Working Conditions Survey (EWCS 2015) and in the context of Eurofound’s concept of ‘sustainable work over the life course’. In the rapidly changing world of work, the traditional dichotomy of employee and self-employed is insufficient to capture the wide diversity of self-employed workers in Europe today. The report Exploring self-employment in the European Union identifies five categories of self-employed, reflecting the wide-ranging attitudes, income levels, and health and well-being among this diverse group. Based on data from the sixth European Working Conditions Survey (EWCS) and the European Union Labour Force Survey (EU-LFS), the analysis reveals that the majority of self-employed workers enjoy high levels of job quality. However, there are concerns in relation to so-called ‘economically dependent workers’: while they are classed as self-employed, they lack both the autonomy that self-employment usually offers and the social protection granted by regular employment. Working time is a recurrent topic of study because the nature of work, its content, the conditions under which it is performed and the labour market itself keep changing. The report Working time patterns for sustainable work provides an overview of the recent evolution of working time duration and organisation in the EU and highlights the most important trends and differences between Member States. Through an in-depth analysis of data from the sixth European Working Conditions Survey carried out in 2015, it examines – from a gender and life course perspective – the links between working time patterns, work–life balance and working time preferences, on the one hand, and workers’ health and well-being on the other. Finally, the report explores the extent to which prevailing working conditions and working time patterns in EU Member States are sustainable in the long term. The joint report Working anytime, anywhere: The effects on the world of work by the ILO and Eurofound synthesises the findings of national studies from 15 countries, plus the European Working Conditions Survey, to consider the effects of telework and ICT-mobile work (T/ICTM) on the world of work. The report shows that this work arrangement is growing in most countries. Positive effects of T/ICTM usually include a shortening of commuting time, greater working time autonomy, better overall work–life balance, and higher productivity. At the same time, disadvantages include its tendency to lengthen working hours, to create interference between work and personal life, and to result in work intensification, which can lead to high levels of stress with negative consequences for workers’ health and well-being.